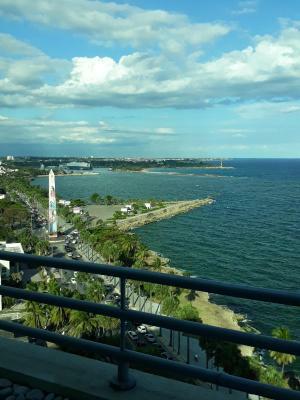 Lock in a great price for Crowne Plaza Santo Domingo – rated 8.4 by recent guests! Beautiful property very well located . Very courteous staff. Very clean.bed are quite comfortable . I loved the view, and my entire experience there😍😍😍🇩🇴🇩🇴🇺🇸🇺🇸, they treaated me with dignity and respect, im considering returning in 3 days. Everything, the room was very clean, well stuffed with goodies, the bed was very COMFY!😍 The restaurant: Yummy Food, the staff is very attentive. Nothing to complaint Lobby: The staff is very polite, whatever you need ... they are ready to help you. Having a room with an ocean view was extra special. How is it that a simple body of water can be so mesmerizing? The gym came equipped with Gary, a knowledgeable, motivating trainer". The pool staff and bartenders were very catering and always kept us entertained. The staff around the facility did make up for our initial checking in experience and that made the trip memorable because they were hard working, polite, pleasant and fun. We did a lot to support room service and ordering on the facility instead of the alternatives. From 7 to 9 pm there was a lovely set up on the 14 th floor. The gentleman there was very polite and made sure everyone there was attended to. (I'm guessing this was the extra $50 a day charge At the initial check-in??).. At times there were many people coming in and out, but he managed to attend to everyone. I made sure to thank him for his services, especially since this was our pre outing gathering before going out in the evenings. Overall, the pool staff, bartenders, bell boys, and 2 of the check-in staff made our trip memorable. The ammenities were superb. The staff very friendly. Thumbs up to the Spa. Ramón the waiter was superb, very sophisticated and polished. He should go far. I went for the national carnival and the location was great. Breakfast also is excellent. Parking is very convenient. I was able to spend time with my family and although things weren’t the best, we made the best of a terrible situation. Crowne Plaza Santo Domingo This rating is a reflection of how the property compares to the industry standard when it comes to price, facilities and services available. It's based on a self-evaluation by the property. Use this rating to help choose your stay! 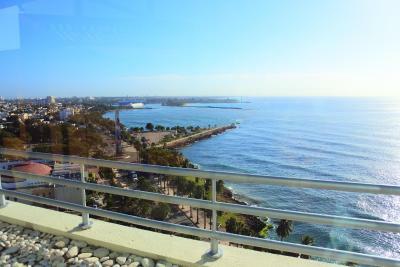 One of our top picks in Santo Domingo.Located right on the Malecon seafront boulevard, the Crowne Plaza Santo Domingo features an outdoor pool and whirlpool, a casino and a spa. Each stylish air-conditioned room offers sea views and free Wi-Fi. The beach is a 35 minutes drive away. Rooms at the Crowne Plaza have elegant contemporary décor and feature a flat-screen TV, work desk and sofa. A coffee maker and mini-bar are provided, while the modern bathrooms include toiletries, bathrobes and slippers. Fine dining is available in the Nabu restaurant, while Kaffetto’s café serves pastries and coffee. There is a pool bar and a lobby bar where you can enjoy music and cocktails. Room service is available 24 hours a day. Guests at the Crowne Plaza Santo Domingo have free access to the 24-hour gym and business center. Free parking is available on site. 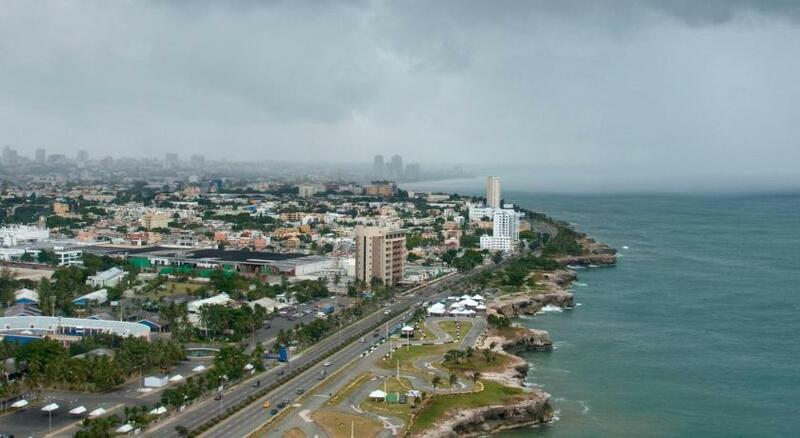 Santo Domingo’s Colonial Zone and the main financial district are just a 5-minute drive from the hotel. Las Americas Airport is a 25-minute drive away. When would you like to stay at Crowne Plaza Santo Domingo? This air-conditioned room features elegant contemporary décor and sea views. It offers free Wi-Fi, and a flat-screen TV, as well as a work desk and sofa. A coffee maker and mini-bar are provided, while the modern bathroom includes toiletries, bathrobes and slippers. 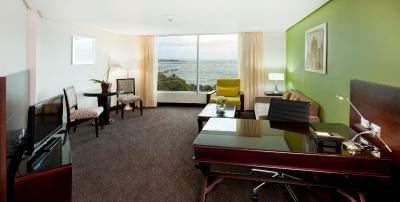 This air-conditioned room features elegant contemporary décor and spectacular sea views. It offers free Wi-Fi and a flat-screen TV, as well as a work desk and sofa. A coffee maker and mini-bar are provided, while the modern bathroom includes toiletries, bathrobes and slippers. This air-conditioned room features elegant contemporary décor and sea views. It offers free Wi-Fi and a flat-screen TV, as well as a work desk and sofa. A coffee maker and mini-bar are provided, while the modern bathroom includes toiletries, bathrobes and slippers. 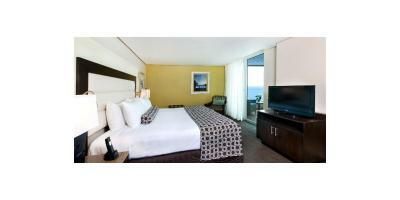 This air-conditioned executive room features elegant contemporary décor and sea views. It offers free Wi-Fi and a flat-screen TV, as well as a work desk and sofa. A coffee maker and mini-bar are provided, while the modern bathroom includes toiletries, bathrobes and slippers. This air-conditioned suite features elegant contemporary décor and has a living room and a balcony with spectacular sea views. It offers free Wi-Fi and a flat-screen TV, as well as a work desk and sofa. A coffee maker and mini-bar are provided, while the 2 modern bathrooms include toiletries, bathrobes and slippers. Air-conditioned room that features a seating area, flat-screen TV, a mini-bar and a coffee maker. The bathroom has a bath and provides slippers and bathrobes. House Rules Crowne Plaza Santo Domingo takes special requests – add in the next step! One child under 4 years is charged USD 25 per night in a crib. Crowne Plaza Santo Domingo accepts these cards and reserves the right to temporarily hold an amount prior to arrival. the cosiness of t6he hotel and the friendly staff for meals...made me feel at home away from home, The rooms are quite big and comfortable. Quality of water in the bathroom is good. I was annoyed at the fact that they listed our room as having a balcony on book.com, but there was no balcony in the room. A property of this caliber in a warm climate specially should provide water to the guest . I paid not only for two bottle of water , room service and 28% local tax just trying to get some water . This is not acceptable . My friend has been there many times and they put me in an old room. Apparently that’s what they do when you book through booking.com. So I had an old out dated room. It’s against a very busy highway so there is no rest and relaxation without horns blowing cars racing tires screeching. The pool is right against the highway as well. Also there is NOTHING around this hotel. You need a taxi or a car rental for anything you want to do. They were polite, the restaurant was good food. Internet WiFi fails too much. They don't have water on breakfast. Not even next to the orange juice. One needs to pay for it. Water is a human right.